The Far East: Monthly Journal, Illustrated with Photographs, Samuel Wells Williams, L.L.D., New Series, Volume 1, December, 1876, text at pages 140-2, photograph opposite page 138), Shanghai, "Printed for the Proprietor, at the Far East Printing Office, 18 Nanking Road," Published Simultaneously in Tokio, Japan; Shanghai, China; and Hongkong. After all the well written and well-merited encomiums lately given to Dr. Williams, to attempt anything more, might seem like a vain effort "to paint the lily, or gild refined gold." Yet there may be some in our midst, who like the great Doctor himself would more prize dates, facts and statistics than even the best deserved comments upon them and to this class of his friends, the following dates and events of his life may not be without interest, as it is the motive of a life that makes it noble or ignoble. Samuel Wells Williams was born September 22, 1812, in Utica, one of the most picturesque cities of Central New York, and there, amid the beautiful surroundings of his birth-place, he first learned that love of nature (still so strong in him), and to look with reverent awe upon wondrous laws by which God controls all things, clothing the earth, with beauty and verdure. In early childhood he showed great fondness for reading and study. Unlimited access to his father's large and varied collection of books incited and gratified this taste, and what is most unusual with great readers, he had a quick, strong and retentive memory, with a grasp of mind that made the reading of books, even books of science, to him, what the careful study of them is to other men. 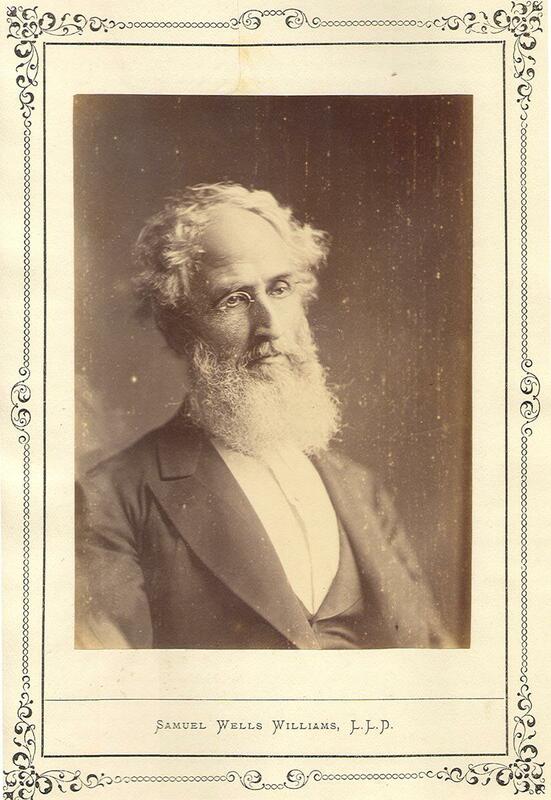 When prepared for college, his love of the exact sciences and natural history led him, in place of going to "Yale" or "Harvard," where so much time is given to the study of the dead languages), to prefer a celebrated school of natural sciences then in charge of the learned Amos T. Eaton, Professor of Botany and Mineralogy. With Dr. Eaton and other Professors, the summer vacations were usually spent in travelling through the neighbouring states, examining and collecting specimens in every department of natural history; which collections still serve to enrich the Institution, now well known as the "Troy Polytechnic Institute, N. Y." A student of such tastes is always sure to be a favourite with his Professors; and his progress in study was such that he was ready to graduate at the early age of twenty, and he was at the same time elected one of the Professors of the "Institute." But duty laid her iron hand upon his conscience. He gave up his much-loved studies for a time, and bowed his heart to her stern voice. On the l5th June 1833, less than a year from the time he graduated, he sailed for China to take charge of the Printing Press of the American Board of Foreign Missions at Canton, and assumed the charge immediately after his arrival, on the 25th October of the same year, beginning at the same time the study of the Chinese language, with what facilities the country afforded and the government allowed. No Chinese were permitted at that time to teach their language to any foreigners: and though they were sometimes persuaded to do so privately, yet such was their fear of the officials, or that it might be known that they were giving lessons to the "Fan-kwei," that they adopted many curious devices sometimes bringing shoes, or some article of clothing, which, when any one came in, they began to talk and prate about, as if they were shoemakers, tailors, or the like, merely calling upon the Fan-kwei on business. In December 1835, Mr. Williams removed from Canton to Macao, in order to finish the printing of Dr. Medhurst's dictionary, in the Hok-kien dialect, which had been left half-printed when the East India Company was dissolved: the Chinese government not yet allowing Chinese printing to be done at Canton. In 1837, he made one of the most extraordinary and venturesome voyages of modern times, in the ship Morrison, commanded by Capt. D. Ingersoll, and owned by one of the wealthy "merchant princes of the east," whose name still stands high among China's best benefactors. The ostensible reason of this voyage was entirely benevolent, i.e., to return seven shipwrecked Japanese who had found their way to Macao, to their own country. That everything might be. done to conciliate the Japanese. Dr. Parker went with the expedition provided with a stock of medicines, instruments, plates and paintings. Presents were provided for the officials, and even one of the partners of the house, C. W. King, joined the party. The ship left Macao for Loo-cloo where it met with some strange, curious and somewhat dangerous adventures. From thence they made fur the bay of Yedo, by the coast of Owari, where three of the shipwrecked men belonged, having taken the precaution to leave the ship's armament at Lin-tin, as did the Dutch traders at Nagasaki. They were thus quite defenceless: were fired on by the Japanese, and repulsed with cannon. This hastened their return bringing the shipwrecked men with them. Yet important commercial results followed, and it was no doubt one of the steps in the right direction by which Japan was at last thrown open to foreign trade and commerce. Dr. Williams speaks of this voyage with lively interest, and has written a graphic account of it in the 6th volume of the "Chinese Repository." In 1840 he completed the printing of "Bridgman's Chinese Chrestomathy" of which, though it is not generally known, he wrote nearly one-half, some of his friends think quite the best half. In 1842 he published "Easy Lessons in Chinese," an octavo of 200 pages, intended to aid in the study of the Canton dialect by a series of exercises and interlinear translations, similar to Sir Thomas Wade's conversations. In 1843 he published "An English and Chinese Vocabulary in the Court Dialect," an octavo of 400 pages, which proved to be a most useful manual, not only for foreign students but for Chinese interpreters and diplomatic agents. In the same year he completed a translation of the Books of Genesis and St. Matthew for the benefit of the shipwrecked Japanese, brought back in the Morrison, in whom he always took great interest, and to whom he contributed largely, by educating and providing for their future success in life. In 1844 he published a second edition of the "Commercial Guide," which though bearing the same name as that written by K. Morrison, was an entirely new work, rewritten throughout, and adapted to the then present state of trade as modified by the treaties. In November 1844 he left China for a visit to the United States, and passed nearly a year in travelling through Syria, Egypt and Europe. So well did he observe and treasure up in his comprehensive mind the scenes and incidents of these travels that, in giving a lecture "On Syria and the Holy Land" some twenty years afterwards in Shanghai, many of his audience thought the doctor must have just returned from his travels: so fresh, clear and minute seemed all his statements in regard to these countries. In 1845 he arrived in the United States, and hardly waiting to receive the congratulations of his friends, immediately started an enterprise of great value to his Mission, which was, to have cut, at Berlin, a new and better font of Chinese metallic type. He was warmly seconded in this by the Rev. Walter Lowrie, secretary of the Presbyterian Board of Missions, though he took upon himself all the lowly details of this most pains-taking work, and immediately began to prepare the list of Chinese characters necessary for its completion; and when funds were wanted to carry on the work with, he taxed no one but himself: but with his usual practical sense and single-hearted devotion to duty, he began and completed several courses of Lectures on China, which were so well received that in November 1847 they were printed under the title of "The Middle Kingdom." Of this book it has just been said that though printed nearly thirty years ago, "it has still a value in the full and accurate instruction it contains on all subjects relating to China that no book of later date has taken from it, and it is therefore still a standard book of reference for every student and Chinese scholar." In the same year the degree of L.L.D. was conferred upon him by the faculty of Union College: and soon after, on the 20th of November, he was married to Miss Sarah Walworth, niece of the well known and highly esteemed scholar and judge, Chancellor Walworth of Albany, New York. The following year, in September 1848, he again sailed, with Mrs. Williams for Canton, and on their arrival, he took full charge of the printing press and also the entire editorship of the "Chinese Repository" of which he had formerly been joint editor for several years with Dr. E. C. Bridgman: the articles he contributed "being mostly on the geography and flora of China. In 1851 this valuable periodical was brought to a close; but not before the accurate and painstaking editor had made a full general and topical index of all the subjects contained in the whole twenty volumes, which index he may well have considered the crowning glory of the work; as it seems a marvel of patience and accuracy, enabling a student to turn at once to any name, date or event in any of the twenty volumes, without losing a moment in looking through or wondering in which volume the desired information may be found. One need only repeat what has just been said of this work by another. "That it is of priceless worth, and the name of the learned editor will be long and honourably remembered by sinologues and students in connection with it." If anyone may be curious to know why the "Chinese Repository" was brought to a close, let him consult the editor's preface in the volume "General Index." "From this time Dr. Williams devoted himself more exclusively to study: or rather divided his time between his books and the service of his country. In 1853 he accompanied Commodore M. C. Perry to Japan and Loo Choo, as Chinese and Japanese interpreter. In this expedition lie was able, by his long experience, wise foresight, and moderation, as well as by the careful discrimination of the special means adapted to a special end, to render invaluable aid to the Commodore in bringing the enterprise to a successful issue; as may be seen by the treaty signed at Kanagawa, March 31st 1854, by which this long secluded country was thrown open to the trade and commerce of other nations. The embassy, in returning stopped at Loo Choo, where Dr. "Williams was the principal agent in negotiating "The Compact," between the United States and the Royal Government of Loo Choo, which was completed and signed in English and Chinese at Napa on the llth July 1854. In 1855 he was appointed Secretary of the United States Legation to China; also Chinese Interpreter; and, in place of Dr. Parker who had returned to the United States on account of his health, Charge d'Affaires. The three-fold duties of these positions, diplomatic, official, and literary, lie discharged with felt ability, and yet found leisure to pursue his favorite studies; never even neglecting the claims of society in which his kindly, genial and thoughtful courtesy always made for him a warm welcome wherever he went. In 1856, he published a fourth Edition of the "Commercial Guide." The same year he also published "A Tonic Dictionary in the Canton dialect," an octavo of 900 pages, compiled with great care and study; examples of the use of the characters "being given by writing their sounds in Roman letters, without the corresponding Chinese characters. Soon after this book was issued, the Mission Press, with all its stock of types and books, about 7,000 vols., was burned with the foreign Factories at Canton. Early in the year 1858 he went with the U. S. Minister, William B. Reed, to Tientsin, where the Treaty between the United States and China was negotiated, and afterwards signed on the 18th June, 1858. In this critical period of his country's history, his sagacity, statesman-like moderation, and firmness were of incalculable value. He had more or less to do with each article of the Treaty; and the 25th -- "Facilities for learning the Chinese Language," with the 29th --- "Toleration of the Christian Religion," are due almost entirely to his fearless patience and determined love of Truth. In 1859, still holding the post of Secretary of Legation and Chinese Interpreter,he accompanied Mr. Ward, United States' Envoy Extraordinary and Minister Plenipotentiary to China, to Peking. 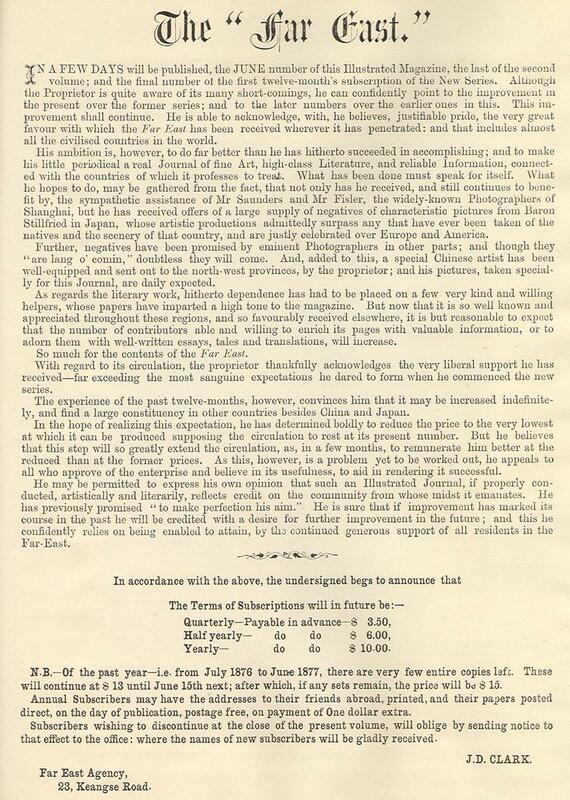 A full account of the Embassy has already been published in one of the volumes of the North-China Branch of the Royal Asiatic Society in Shanghai, for 1860. In 1860, Dr. Williams made a short visit to the United States. Returning to Macao after an absence of twelve months, he was again appointed Charge d'Affaires of the United States' Legation at Peking, and soon after went there with his family to reside. In 1862, he published the valuable "Book of Treaties " (between the United States and China. Japan, Loo-choo and Siam) for the guidance of the U. S. Consular Courts. This is an octavo of about 200 pages, containing a Tariff of duties on the American Trade with China, (imports and exports) besides a great deal of new and important information regarding the laws and commercial interests of nations with each other. In 1863, he published a Fifth Edition of "The Commercial Guide," which contained so much new and important matter and was so adapted to meet the new trade regulations of the Treaties of 1858, that it may be considered a new work. During the years 1874 and '75 he carefully revised and published the great work of his life, "A Syllabic Dictionary of the Chinese Language," a quarto of 1,320 pages, three columns of characters and definitions on each page. In the preparation of this inestimable work Dr. Williams was engaged eleven years, though, in reality it is a compendious cyclopedia of his 42 years study, experience and knowledge of the language, literature, history, geography, science, philosophy, religion, government, habits, customs, manners, trade, commerce, etc., etc., of China and the east; and for accurate and comprehensive information, it will for a long time, perhaps for ever, remain unrivalled. In 1875, Dr. Williams revisited the United States for the third time in 42 years, hut remained only a few months. On his return, he went directly to Peking and resumed his official duties in the United States Legation, which after some months he resigned: having been connected with the Legation 21 years, in the course of which ho had acted as Charge d'Affaires nine different times. In the most critical periods of his country's relations with the East, he brought to the difficult duties of his office, a rare sagacity, the truest patriotism, with unwearied industry and ability; his whole course having been one of unfaltering and unswerving rectitude from first to last. He resigned his official position, chiefly on account of failing eye-sight, and left Peking on the 25th October 1876, just 43 years from the day he first landed at Canton, 25th October 1833. Such, lives need no comment, unless it be to speak of the foundation upon which such indefatigable labour, single-hearted devotion to duty, and massive strength of character is built. But for this, a hasty sketch allows no time. There are many, even men in high positions, whose only, influence is to crush out the little faith and courage that one has. There are others, who like Dr. Williams, restore the equilibrium, and the spirit is ready to exclaim, "Since I have known thee, my soul hath dwelt apart, in shining brightness and the path of truth." And it is ever thus, that the good who pass from our midst, live yet more nobly with us, by the persuasive beauty of their example. (The Far East, New Series, Volume 1, December 1876, pages 140-2).